Height/Weight: 6’ 2” 203 lbs. Past coaches: Anthony Gilich, Bob Bishop, John Haar, Greg Hamilton. 2017 season, as a sophomore with the Central Arizona Vaqueros: 6-3, with a 5.20 ERA in 16 games, making 13 starts ... Walked 34 and fanned 52 in 62 1/3 innings. Honours 2016 _ Earned all-tournament honors for Summit Conference ... 2015 season _ BC Premier League Pitcher of the Year and First Team All-Star honours. 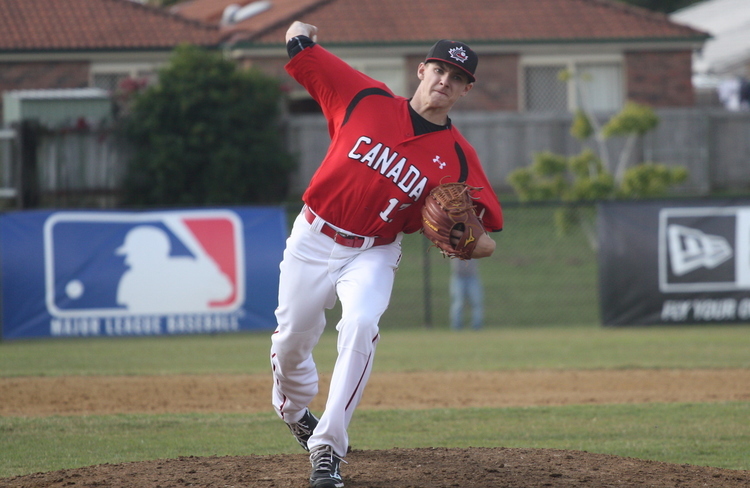 High school: Helped lead British Columbia Orange to the Canada Cup national championship in 2014 ... Was 5-1 record with a 2.10 ERA striking out 45 batters in 46 2/3 innings ... Pitched for two provincial championship teams ... With Candian Junior National Team: On the D.R. tour vs. rookie-class Dominican Summer League teams Allowed five runs -- two earned -- against the Mariners ... Facing the Cubs, gave up two singles and a run in the first then set down eight in a row, including two strikeouts ... On FLA trip: five strikeouts in five innings against Blue Jays plus Tigers minor leaguers ... Five scoreless to beat Ontario at Canada Cup in Saskatoon.